I’ve been playing with these simple Solar lantern controller ICs recently. They’re the chips used in most cheap solar garden lights. Akiba and I have built a couple of products around these chips and have more in the works. They’re pretty amazing ICs given that they cost almost nothing and contain a complete NiMH charge controller, boost converter, and PWM LED driver. The basic circuit from the datasheet is shown to the left, and aside from the IC itself you just need to add a single inductor, NiMH battery, solar cell and of course the LEDs to complete the circuit. 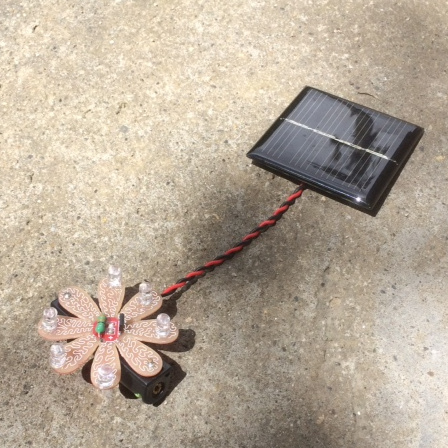 It uses the solar cell both to charge the battery and as a light sensor. 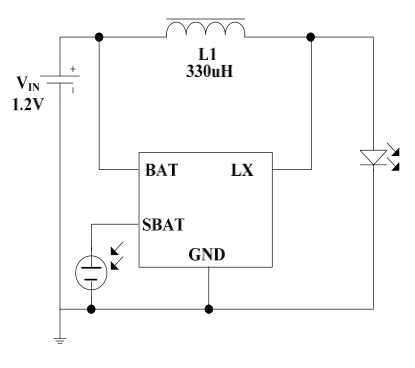 When voltage from the solar cell falls below 150mV the IC will switch into illumination mode and start powering the LEDs. Rather than a typical current limiting configuration, the IC slightly overdrives the LEDs but uses a 100KHz pulse-train to drive them which they suggest results in >90% efficiency. Considering the IC basically costs nothing this is pretty impressive. I have a set of 10 ICs+inductors on my shop if anybody else wants to play with them.